Several years ago, I came up with an idea for a custom set of symbols to be embedded into a font for my HQR project. Biff over at Old Scratch, being the ossum fellow he is, put something together for me (find it here: https://www.dropbox.com/s/2doo6twyjqwfm ... R.ttf?dl=0). Count Mohawk liked this idea, and ended up making his one (http://tinyurl.com/ITC-HQ82). Meanwhile, Lemron and Anderas started using similar fonts. 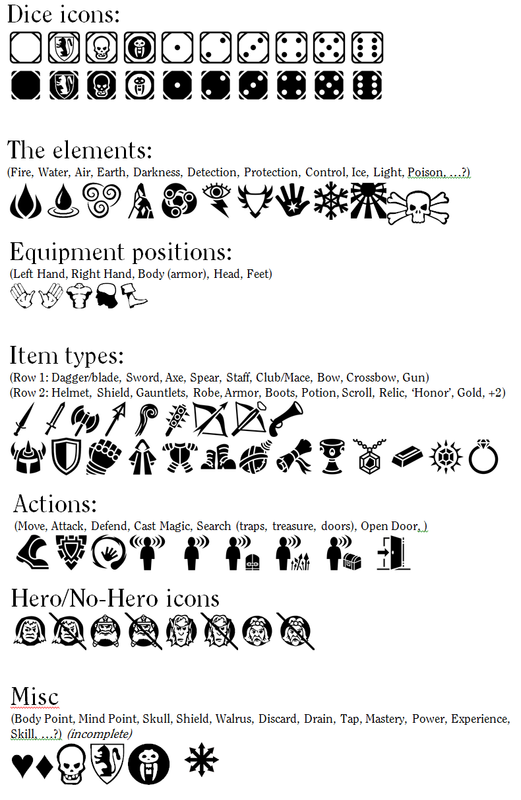 So, the idea I now have is to build a single font that can fill all our HeroQuest needs, "HQ Modern". It will have a range of icons, facilitating our many common terms from not only my own HQR, but from everyone else' projects too! I'd propose that this be based on Arial (since it's nice, easy to read, generic, and takes up little space). I have gone through my list and found nearly everything. Now there are only some things left to do. Equipment materials (optional & quite low importance): Wood, Metal, Fabric, Leather: I guess I can live without them. Equipment nature: Scroll, Potion, Weapon, Armour, Equipment: I think only potion and "equipment" are missing. "Equipment" is for everything that doesn't fit in the other categories, like the toolbox. houserules - Additional movement (run), Wait to be last, Go First: guess I can live without in fact. Last edited by Anderas on Friday November 6th, 2015 7:51am, edited 1 time in total. Anderas wrote: This is quite a maximum List of Symbols - i have the habit to exchange only the most often used words or phrases by symbols. You can invent a whole sign language, but that's not the target. The target is to replace the eternally repeating minisentences on the cards by something you get on the first glance and that needs no translation. yeah, that's a LOT! But I think we all have the same idea! The only objection I have to using Arial as the base font is that Arial is not one of the traditional HeroQuest fonts (Caxton, ITCClearface, Plantin, etc.). However, Arial-HQR as constructed by Biff does not cause any problems when used in Photoshop CS2 (which indicates to me it will work with all Photoshops), which is arguably more important. Please feel free to make any number of comments or suggestions as far as what you guys want to see in this font! Linking me to useful images would also be helpful, although if they're in more than two colors I'll have to B/W them down to be useful. /the more I see it, the more I'm sold on ITCClearface. For drain, look at your font "Latin Capital Letter I with Macron" on the character map. For "attack" a sword crossed with an arrow would be perfect. Perhaps you can steal Anderas's discard icon? For mind points, I'd prefer a drop kind of shape. Would fit my blips. Other than that, off my frontal lobe, even with my specialized linguistics, everything's there. Thanks for the effort, guys, I for one appreciate this. Anderas, you'll be happy to see me use these on my cards. Gonna be awesome. KK: Do you mean a water-drop-shaped MP icon? I have several in that vein I could use; perhaps the third one from the left in the following image? Slev: It was easier to reproduce Anderas's two custom icons (the crossed-out card and the book with a bookmark) than to find similar un-watermarked ones on Google, so I indeed resorted to thievery. Muahahaha! I think that should fill out the list. If I'm not missing anything important, the next step is to vectorize the PNGs I haven't done that for already, then load them into ITCClearface and test how Photoshop reacts to them. Not much point in making a custom font if you can't actually use the symbols, eh? I think in the last row "attack" is missing. Do you have any idea how to show ranges? Actually, it's "skill" that is missing, but I can get around that! Anderas wrote: Do you have any idea how to show ranges?